Sky Transportation Solutions is your Fresno trucking permits expert, we have staff that provides quick turn-around and is reliable. Fresno, whose name is the Spanish word for “ash tree,” is located in the San Joaquin River Valley in central California, midway between San Francisco and Los Angeles. Fresno’s growth began in the 1870s after the site was selected as a station on the Central Pacific Railroad. The area’s great land and weather attracted farmers and ranchers, many of them immigrants, resulting in a melting pot of nearly 100 nationalities still reflected in Fresno’s culture. In 1875, the raisin industry started in Fresno by accident, when grapes at a vineyard were allowed to dry on the vine. Today, Fresno is among the nation’s 40 most populous cities, with a population of around 430,000 and a rapidly-growing metro area. Fresno County’s $3 billion agriculture business makes it the top county for agriculture in the country. Grapes, lettuce, cotton and tomatoes are the leaders among its more than 250 crops. Fresno’s economy is also supported by diverse industries such as agricultural chemicals and equipment, food processing, computer software, glass and plastics. Aided by its proximity to both San Francisco and Los Angeles, Fresno is enjoying a growing convention business. 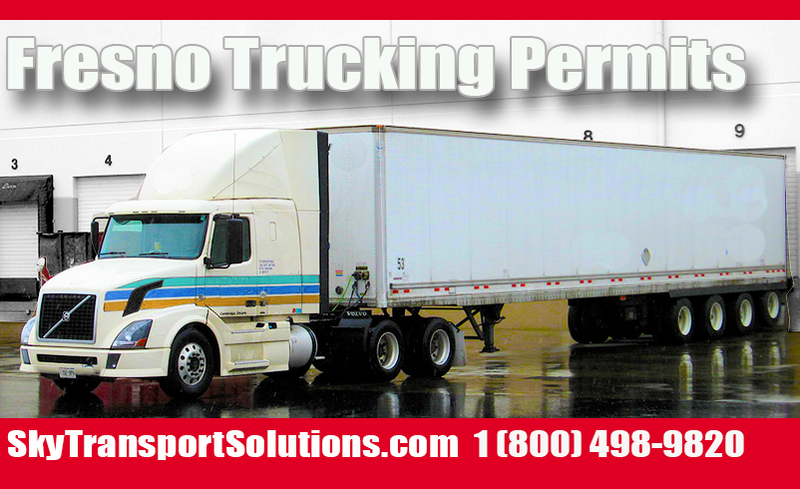 Fresno trucking permits are always required when a new trucking company opens up. Trucking and transportation are major industries in Fresno, this means warehousing and logistics are very common in the region. Large trucking fleets and owner operators rely on Sky Transport Solutions for their Fresno trucking permits. Many clients have had to come to Sky Transport Solutions the last moment. This is because they got a fine from California Highway Patrol (CHP) for not being in legal on the road. Don’t let this happen to you, the staff at Sky Transport Solutions is always available to help you. So when you need your Fresno Trucking Permits call the expert staff at Sky Transport Solutions. 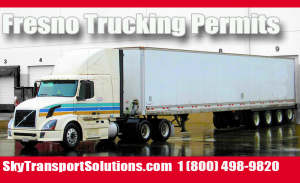 Our staff is available 24/7 for all your trucking permit needs. The staff at Sky Transport Solutions is here to make sure you are on the road hauling freight and legal and in DOT compliance.